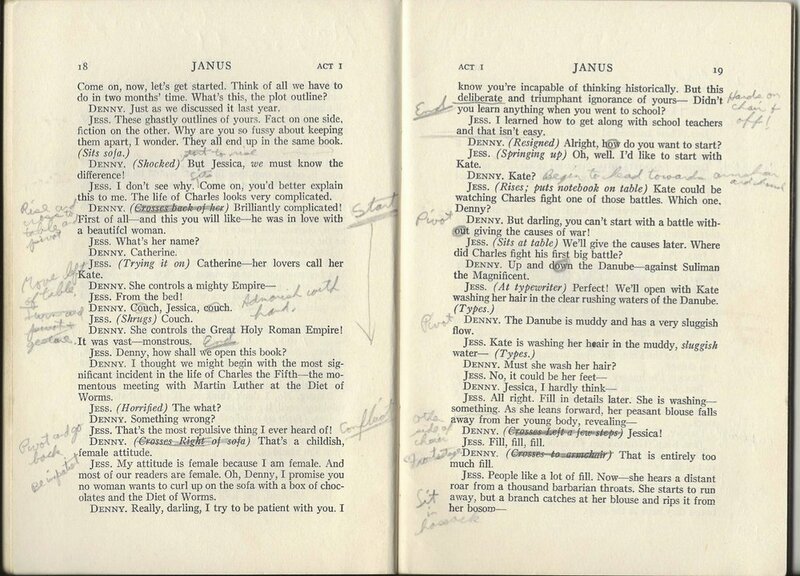 According to the rehearsal schedule, we had just over a month to bring Janus to the stage. Happily two of the three leading parts had been cast with truly outstanding amateur actors, and in another life either or both of them might very well have made choices that would have struck the “amateur” from that description. There was Molly Costello, a bright, late-twenty-something woman from Lancaster playing Jess, one half of the Janus writing team. She had had some experience acting, and she was a delight to be around, both on and off stage. She took direction well, and never had to be told twice what to do in a scene. Sometimes not even once. 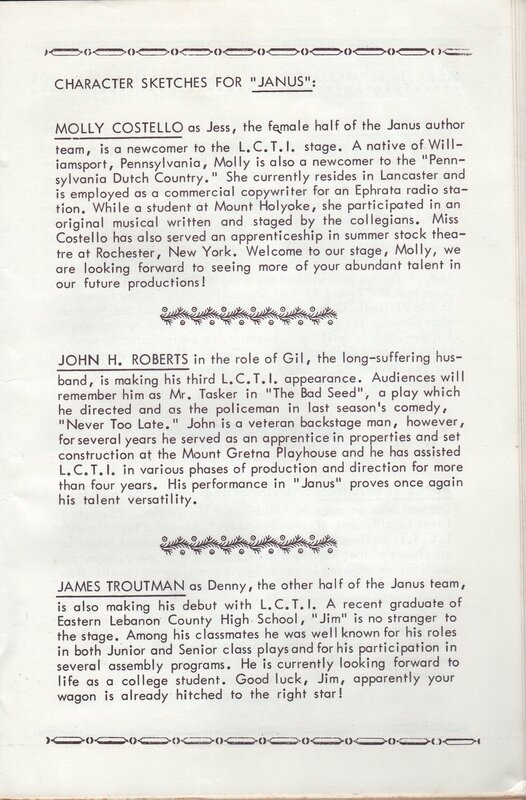 And there was John Roberts, a burly, late-thirty-something veteran of the LCTI stage playing Gil, Jess’s husband. He had a commanding stage presence, was a natural comedian with a great sense of timing, and even when he flubbed a line, his ad lib kept the action moving without a break. He had a wonderful sense of humor and was a lot of fun to be around. I had very limited experience on the stage, I was nearly 20 years too young for the role whereas the other two actors were nearly age appropriate, and then there was the problem of my voice. Now for some time I had been told that my voice was one of my great assets even though I could never hear it myself, but I had come to accept it. There was a problem though: my Pennsylvania Dutch accent. Specifically how I pronounced, well, “how”, for example. “How now brown cow”, that classic elocution teaching phrase, in my rendering would sound more like “Haw naw brawn caw.” That just would not do for the role of Denny, a public school teacher from Andover, Massachusetts. Mrs. Papson, our high school Public Speaking and English teacher, had tried in vain to vanquish those “aw” vowels from my speaking voice. Now the need was more urgent. Plus, Denny was a teacher of French, and it was implied that he had a slight French accent (the play was intended in part as a variation on a French bedroom farce). The Director, or John as I now felt more comfortable with him, suggested that I only needed to imply a French accent by pronouncing some vowels in the French manner. But I think I would have needed a vocal coach to work with me on that, and neither John nor I really had the time for it with so many other things to work on in that month. It’s my greatest regret about performing in that play. In the end we had to adjust some of the dialog where Denny is referred to as a “Frenchman”. It certainly removed one subtlety from the play, although I don’t think it did it any great harm. But sometime in that first week of rehearsals, when he saw me interact with Jess and Gil—oh, I should note that during the rehearsal process we were almost always called by our play names. John always called me Denny, for instance. I’m going to do that as well, as I think it will avoid confusion between John Roberts who played Gil and John Osborne who directed. So one evening I went over to Betty Schultz’s house, which as I recall was right on Cumberland Street, and we spent an hour or so talking about the play, my character, and various other theatre-related topics. Since Denny was a pipe smoker, as was Betts’s husband, she found an unused pipe on his pipe rack and gave it to me to use as a prop. Finally, she decided that I had a pretty good grasp on my character and sent me on my way. There was no discussion of acting more like a man. As I think back to that period, the month that we were rehearsing Janus may very well have been one of the busiest times in my life. I was still attending high school with graduation coming up near the beginning of June, at an LCTI meeting I performed in a repeat of a show that we had previously put on as an exchange assembly for Annville-Cleona High School, and right after graduation I started a job at the VA Hospital in Lebanon, PA. Meanwhile, not only were we rehearsing a play, but there was some backstage drama going on as well. Isn’t there always?